I’ve just returned from the Folk Alliance International Conference in Kansas City, Missouri. It was amazing in so many ways. Imagine a couple thousand people holed up in a huge convention center, all there to listen to, or perform music. Everywhere I turned there was something worth seeing or hearing. So much talent and energy in one place! The experience is hard to wrap one’s mind around: it was overwhelming. Florida was well represented by Sandhill Stage artists The Currys, Flagship Romance, Grant Peebles, and yours truly. My all time favorite new discovery was a Swiss group: The Authentic Light Orchestra which was fronted by vocalist extraordinaire Veronika Stalder. Check them out on youtube if you get a chance. It was my first time in Kansas City and what a City. I met many, many locals who were artists and volunteers. Everyone I spoke with was friendly and absolutely loved living there. 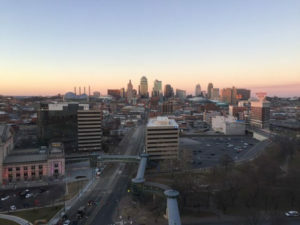 Besides a lively music scene, Kansas City boasts a vibrant arts scene, a huge WWI memorial, Union Station, many museums and easy ways to get around the city. Glass walkways rise over major highways and connect hubs of activity while a free tram runs back and forth from the historic river market district. The weather was in the seventies practically the whole time I was there. So much for the coat, sweaters and hats I packed! Crazy. At the end of the conference I had the great pleasure to visit the museum at Union Station (lower left of photo) which was hosting the traveling exhibit of Pompeii, something I’ve always wanted to see. Both Union Station and the exhibit in the museum were impressive to say the least. Now, back home and recovering from all the excitement (and the flu), I’m turning to the springtime garden for inspiration and restoration. Let the fun begin.